Ask twenty friends who their favorite poet is and you’re certain to get twenty different answers. William Shakespeare, Sylvia Plath, Emily Dickinson, and Robert Frost roll off the tongue easily – the greats, the classics. But ask Amazon who their customers’ favorite poets are and you’ll get an entirely different set of answers. Today we’re exploring seven of Amazon’s best-selling poets and their rise to prominence through social media. 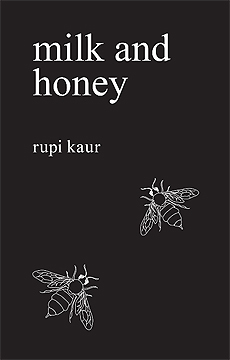 Rupi Kaur’s debut poetry collection Milk and Honey was published in 2014 and seems to only become more successful with age. If you’re active on Instagram, you’ve probably seen this book cover in your feed, @rupikaur_ tagged in the photo. Kaur has 1.5 million followers on Instagram, proving that her brand of poetry is a visual medium. It’s a platform where she’s managed to follow zero accounts, preferring to use the app as a mobile gallery for her professional grade photography and her words. She gives away so much of her writing for free this way, but if her consistent presence on both Amazon and the New York Times’ bestseller lists is any indication, her readers prefer to clutch her book in their hands. In July, Kaur announced that her second book of poetry would be released in October. The Sun and Her Flowers is also among Amazon’s top 10 poetry bestsellers. 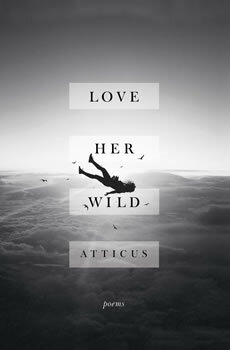 Writing under pseudonym and wearing a mask to ensure anonymity, Atticus’ debut collection of poetry Love Her Wild was published earlier this summer. The mystery of his identity hasn’t deterred readers – especially those who have been following him on Instagram and Twitter for years. His Twitter bio is modest, despite his ten thousand followers. “I’ll try to post a poem every day,” he says, sharing his work freely with the social media fans responsible for his book deal. His Instagram presence is even larger – 409,000 followers punctuated with the kind “Thank you for reading, I love you for that.” In 2016, Teen Vogue named him the best poet on Instagram and Galore voted him the most tattoo-able poet, nodding to the number of women who have tattooed his words on their body. And all that before his book was even published! K.Y. 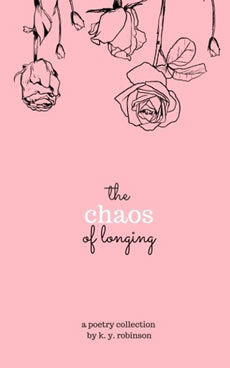 Robinson’s self-published The Chaos of Longing is a testament to not only her skill as a writer, but also her drive to break out from the pack. Robinson released The Chaos of Longing without a marketing team or a large social media following, but has sold over 15,000 print copies of the book in the last year between Amazon and the self-publishing site createspace. The self-published edition of The Chaos of Longing will soon be retired in favor of an expanded and revised edition published by Andrews McMeel Publishing in September. (Robinson admits in the FAQ section of her website that despite several rounds of edits, she still finds errors in the self-published edition.) “You guys have been the best readers a girl could ever ask for,” she writes in an Instagram post earlier this summer. “All of your messages and emails telling me what this little book has meant to you made me feel like self-publishing this book was worth it.” We cannot wait to see her success multiply. 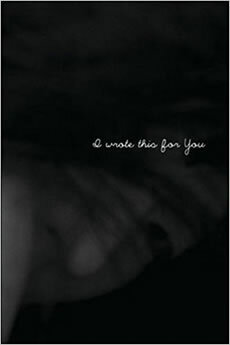 Iain S. Thomas started writing under the pseudonym pleasefindthis in 2007 when he started the Blogger site “I Wrote This for You” with photographer Jon Ellis. The Capetown, South Africa, resident gained a loyal online following through the blog, which translated well to book sales when I Wrote This for You was published in 2011. He’s since gone on to publish six other books based on the blog, but I Wrote This for You remains Thomas’ bestseller. While Thomas still updates the Blogger site, he’s parleyed his social media cache into a healthy Twitter and Instagram following. He’s also the fourth most followed author on Goodreads, natch. Neil Hilborn came up through the world of slam poetry, taking the performance aspect of poetry as seriously, he told The Triangle in 2014, “as [he] would if it were [his] job.” But he’s quick to explain that it wasn’t a source of income for him – at least not in 2009 when he started. “[T]here was definitely no money in it. I won $20 at a slam once and I was ecstatic.” Hilborn then went on to tour, teaching workshops and coaching slam poetry teams on the road. In 2014, a video of his poem “OCD” went viral– clocking in at a staggering 13 million views to date. His social media accounts are friendly and engaging, interacting with readers through reposted photos and Twitter replies. It’s so easy to imagine that you’re Hilborn’s friend, so it probably comes as no surprise that we cheered when we saw his poem on the Smoke Signals BBQ sign. We’re tempted to buy another copy of his book right now. Amanda Lovelace’s poetry has been shared widely on Tumblr by her avid fan base – emulating the writer herself and her practice of sharing her own work on Instagram. The text – white words on a black background – form a racing stripe down the center of her feed, balancing personal and fan photos with her relatable poetry. Her audience – 14,000 followers and counting – have fueled her to the top of bestseller lists, Amazon among them. Her constant and encouraging engagement with her audience via social media and her compulsively Instagrammable book cover has ensured the princess saves herself in this one is not only a bestseller, but also the 2016 Goodreads Choice Award winner in the poetry division. Her sophomore collection, the witch doesn’t burn in this one, will be released in March and is sure to be a bestseller. Reuben Holmes aka r.h. Sin began experimenting with Twitter in 2006, when the social media platform was in its infancy. After creating and tweeting from several vanity accounts, including the now defunct @itweetfacts, Sin created an account to showcase his poetry. Six hundred and twenty-six thousand followers later, he’s taking the social media world by storm. His Instagram account is the real star – a literary journal of sorts for Sin to share his own work and the poetry of his partner Samantha King. In an interview with The New Yorker earlier this year, Sin confided that the two met over Instagram DMs, so the platform has been life changing in more ways than one. Writing an astronomical 7,222 words a day keeps Sin busy enough, but growing his social media audience is always top of mind. “I came into 2016 with 251,018 [Instagram] followers,” he told The New Yorker. “I entered 2017 with 515,164. I am a workhorse.” Sin’s A Beautiful Composition of Broken also appears on Amazon’s top 20 poetry bestsellers – an accolade he shares with fellow poet Rupi Kaur. And knowing Sin’s focus on numbers, we think he would call it an accolade as well.